I have to admit, I find myself surprised by some of the rankings. The .270 higher than the 22-250? The 25-06 higher than the .220 Swift? I may need to reconsider some of my preconceptions. Thanks for putting together the chart. It seems this subject requires further exploration and explanation. Case capacity has a direct relationship to the powders required in terms of burning rate, flame temperature and duration. Probably more important is the abrasive residual carbon to grind away at the throat after each shot. Bullet weight, style and length selection are a function of a barrel’s twist rate and all contribute to powder selection for most all those cartridges on the scale nominated as overbore. 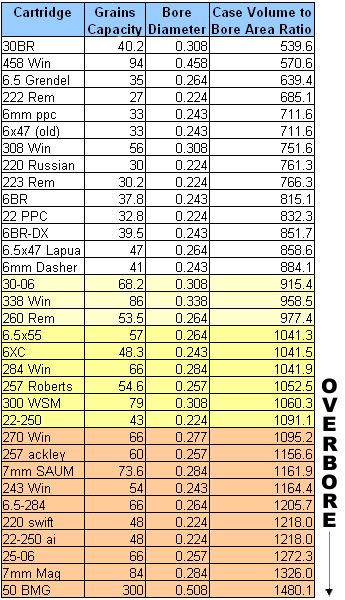 Norma ran tests to see whether bullet coatings had a significant influence on barrel wear with some amazing results. A similar test for different powder burn rates would also be very interesting. Extremely expensive and very time consuming, but interesting. Wouldn’t mind betting that pops a few eyeballs open. Since Bryan Litz is a well regarded ballistician and has written two books on this subject matter he might be a good source to put this issue in perspective?? What say you Mr. Litz? It’s only overbore if you don’t have a powder for it. The term “overbore” is overused. Really no such thing. A good initial test of a new hypothesis is “Does it make sense?”. This one is suspect. The units of the overbore index given are volume/area which equals length, so overbore is measured in inches (? ), which seems to fail the common sense test. Another reader mentions powder choice. While your 308 is overbore with Bullseye, it isn’t with 4831, so something is missing there. There has been a better index of “overbore” readily available for some time. It’s usually called “Ballistic Efficiency”, and it is the ratio of chemical energy stored in the powder charge to kinetic energy imparted to the bullet. The Quickload software reviewed on this website calculates it as part of the results. Josh is onto it here. Efficiency is the issue. Case capacity “overbore” is irrelevant if you don’t include the volume of the barrel, hugely influenced by length, not just bore diameter. Quickload isn’t a perfect load guide, but there isn’t anything better available to hand loaders. A relative efficiency guide would be interesting, but if you have Quickload, you already have one. If the point of the exercise is to determine an index that roughly correlates to barrel life then I think the answer to the common sense question has to be yes! If the information is applied and compared to real-world results, I would anecdotally agree that it is surprisingly accurate, however there are numerous contributory factors. What is missing of course is a compendium of evidence to back it up, and therefore this must be viewed as a guideline. Of course I can stand up and tell you that your 6.5-284 or 7 SAUM will no longer be reliably competitive past 1000 rounds, and someone will pipe up and say theirs is just getting broken in with that many rounds.